It's always a function of perception. What is great customer service to me may be horrors to you. What is a snow storm for me in Atlanta may seem like flurries to my friends in Boston or in Canada or in New York State. 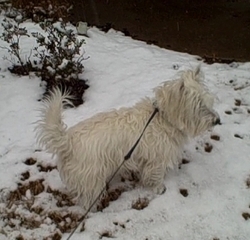 For Max the inch of snow that fell in Atlanta yesterday seemed like a blizzard. Lessons Learned: Don't assume that your perception about your product/service is the same as your customer's experience. Amen, Toby! We need to spend more time walking in the paws, I mean shoes of our customers in order to understand their perspective. Sitting around in a conference room discussing what we think our customers think is a waste of time. We need to go out and ask our customers, meet them where they live and see how they use or products and services, then go make something that meets their needs. Thanks Toby for this simple but to the point post. Perception is important but the reality is more important. Taking the time to evaluate each of your customer's needs, wants, abilities and time. Some of my customers aren't as tech savvy so I have to communicate with them a bit differently then someone who has their own online business for 10 years. By placing myself in their shows and realizing what EACH of them would appreciate...that is how I approach my relationship. Customers will appreciate it when you show you care about their needs and wants. I have a brief consultation with each new client to see what they need, what they have going on and what they want. This makes it much easier and creates a quality relationship .